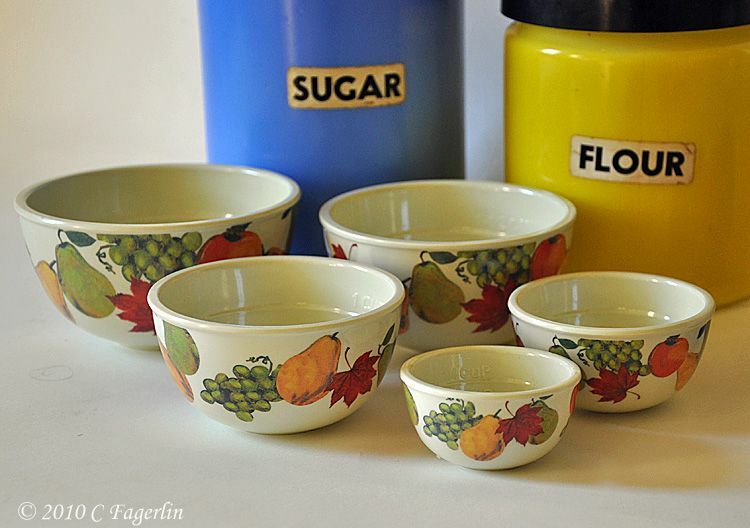 It's time again for Vintage Thingies Thursday brought to us by our hostess from Coloradolady. Gather up some of your vintage things and come join the party! I'm also joining Jenny Matlock for Alphabe-Thursday. 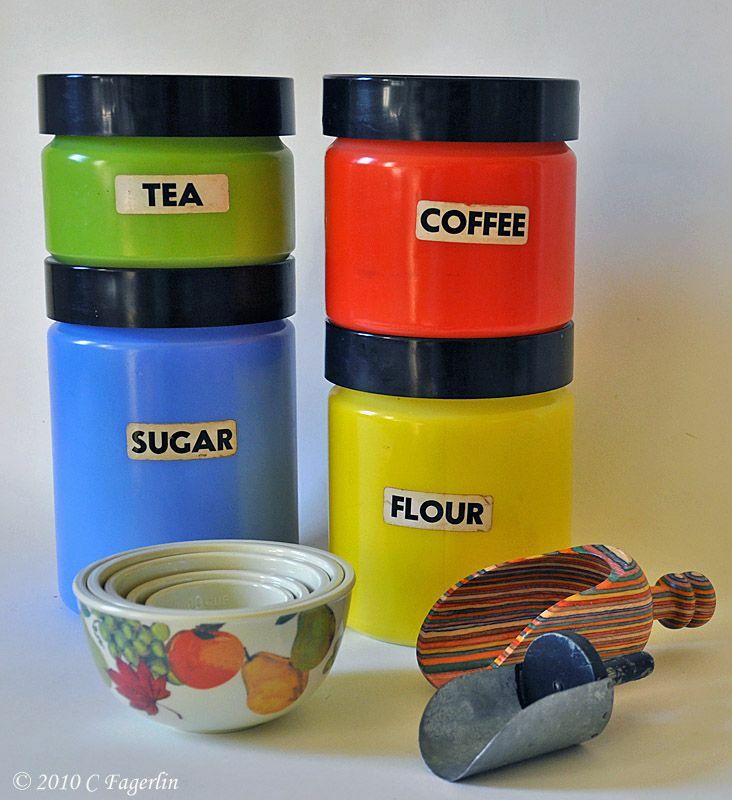 This week's letter is "C" for Canister and sCoop and measuring Cup! are new, but they all have a place in my kitchen. former owner. At first I thought I would remove them, but I decided to leave them intact. She must have used more sugar than flour ..... notice the sugar is the largest canister! size from a 2 cup size down to 1/4 cup. They are very handy! and Alphabe-Thursday, hope to see you again next week. Please check out my tablescape posted for this week's Tablescape Thursday. Oh, what a treasure to have that scoop Mr. TLRT made in junior high! All those bright and beautiful colors! I am in a rainbow! I love it! Love your ‘C’ post! Such gorgeous colors! I love the scoops! 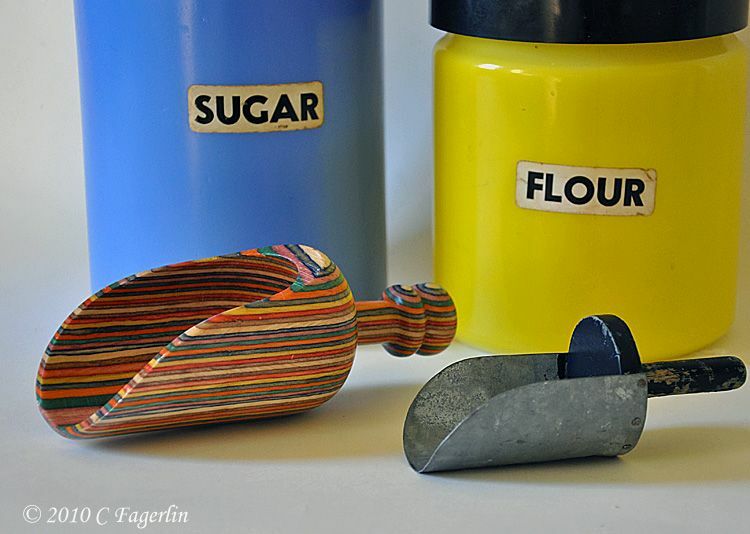 Definitely seems like someone had a sweet tooth in the canisters' prior home! What fun, bright canisters!! And I really like your rainbow scoop! I have some wooden spoons like that. I love the handmade scoop! Oh they're so pretty! I saw a set of 3 in that same green color yesterday, but passed them up in favor of a discounted Pyrex mixing bowl instead. 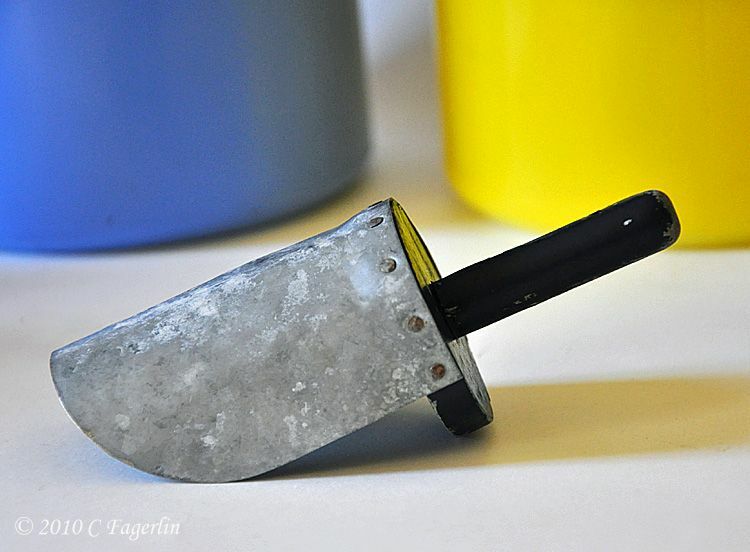 I really like yours with the variety of colors- and that scoop looks like it was just MADE for them! Happy VTT! i love love love those milk glass canisters and the older flour scoop ... give me vintage any day ... mind you your multi coloured scoop is really cool! 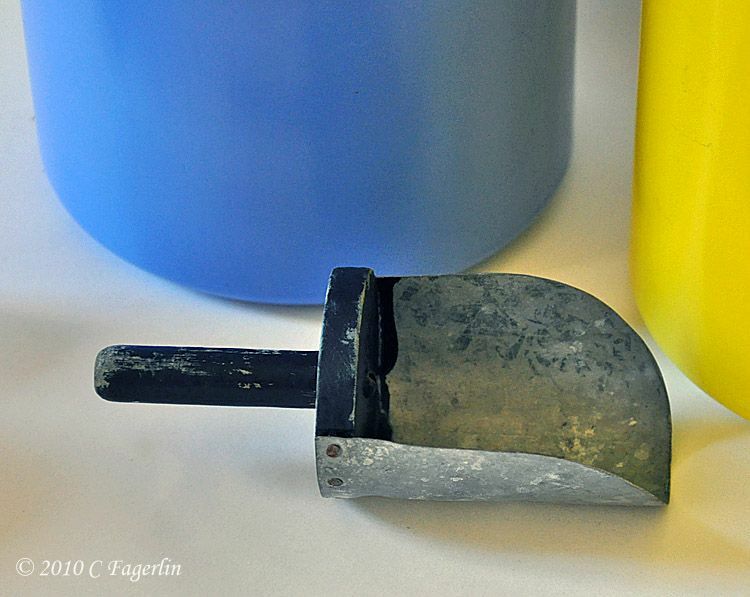 The shop made scoop looks like it has been used to make many wonderful things. these are homely sweet and lovely..
Hi...It’s Genie stopping by again to check out your post. Those canisters are so colorful and in such fine condition. I am glad you left the labels on them...they are charming, too. The old scoop is so neat...full of memories and sentimentality. Your post was most enjoyable to read and view. I like these canisters, even tho I have not seen them before. You have a nice selection of vintage things. The canisters are amazing, I have not ever seen any like these. I really love your scoops too! I have one that was a plastic tupperware one that belonged to my grandma, I use it all the time. Have a great VTT! wow! the canisters colours are so bold and vibrant! and retro too! will match very well with your fiesta ware.. thanks for sharing..
LOVE those cannisters. I admit to having a couple of old scoops myself. Cute Canisters make a cute C post! Those are the most adorable set of jars, scoops and measuring cups! I love the colors! Funny how the sugar jar is the biggest one! I love that you have that old scoop, how great is that. Love all of your kitchen accessories. 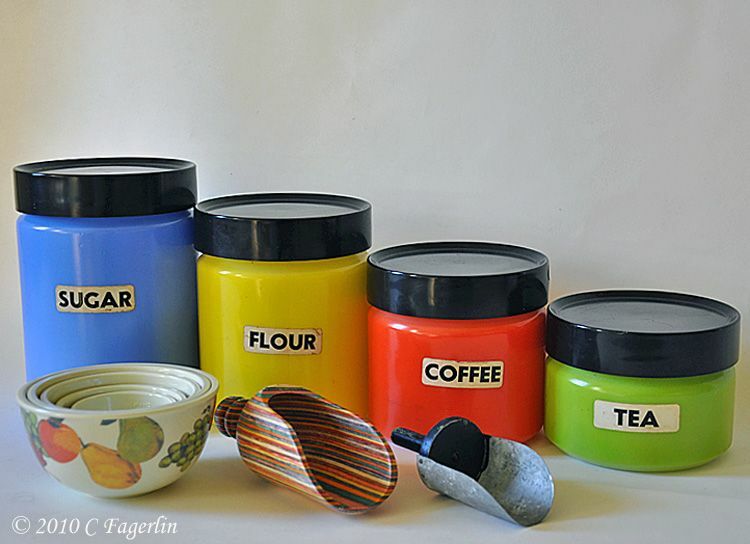 Those canisters are fabulous and I love the scoops too. What treasures you have!! Those canisters are really cute! I LOVE those canisters. I am on the lookout for my own vintage set of canisters -- I might find something similar. And how very sweet that you get to use the scoop your man made when he was young. It has so much character too! I'm so pleased you enjoyed your visit to my blog and seeing my vintage canisters! Thanks for coming by again this week. I saw a set of these canisters on eBay last week for around $60 ..... WOW ..... I can tell you I paid about $10 years ago in an antique mall in Ohio that I visited during a trip to Homer Laughlin China! Thanks again for your lovely comments! Oh my! I adore those cannister colors. I have a set of pyrex bowls in those colors. You have such amazing treasures and such an eye for collecting. I always love visiting you just to 'wish' and 'imagine' what my kitchen could be if I would just put some effort into it. I'm struggling with coming up with something equally appealing for this week's "D" entry....still thinking teacher! Love visiting your kitchen! C or no C-word. Hi Anna, thanks for coming by! LOVE those bowls! the scoops are cute also! Every time I use the old scoop that belonged to my MIL, I remember all the wonderful aromas that came from her kitchen. She was a great baker of sweets!